Vol. 6, Iss. 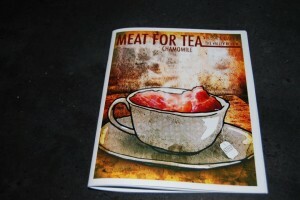 2 of Meat for Tea: The Valley Review includes the Azuzal short story “D.O.B. + 195” and a CD (yep, a honest-to-Cthulhu CD) that features 2 Azuza Inkh songs: “I, Beaver” and a live ’11 version of “Miasma Haus.” There’s a huge number of short stories and illustrations in the magazine, as well as an interview with David Yow–who drew the cover–on the disc. This entry was posted in Azuza Inkh Events. Bookmark the permalink.